Andree, Baier, Derrick, Jay, Jeff Kewer, Jesse, Movies, Nader, Scottie D.
Tonight was the big Rambo night. Below is a picture of the gentlemen that made their way to our local multiplex to view Rambo with me. 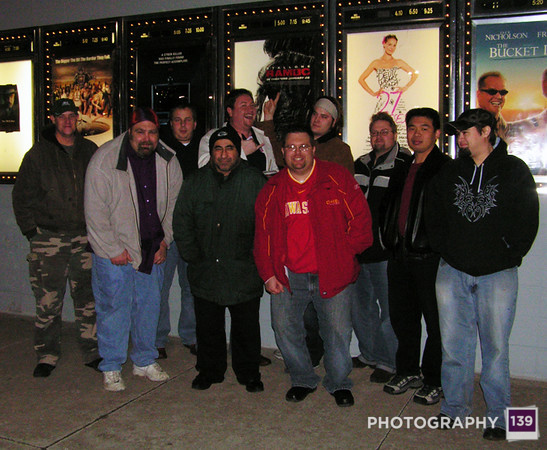 Pictured left to right: Jeff, Yours Truly, Scottie D., Jesse, Derrick, Jason Baier, Jay, Andree and Greg. Not pictured is Russell. He finally relented to viewing Rambo despite contending that his “self respect was not expendable”. However, Russell took off immediately after the film and is not in the photo. Preceding the movie was a dinner and Rambo discussion. Almost everybody shared a favorite Rambo moment from the past. I will publish those in due course, after I compile my own personal list of my ten favorite Rambo moments. Previous PostAngry Brad’s DesignsNext PostGod Wants to Use Us! What a motley crew. Nothing like a bunch of guys getting together to watch an action flick. Nice.